Now, this is a flavor that gives menthol a run for his money. This mint flavor also has the icy sensation we love to feel when we are using our vape pen. However, this minty blend emphasizes more of the peppermint taste than the spearmint one. When inhaling this flavor, you get the feeling that you are standing in the middle of the Arctic trying to be the first to climb a snowy mountain. Except, the cold does not faze you. You feel the icy feeling slowly taking over your body, but you love it and do not want it to stop. Once you realize you have to breathe, the iciness exit your body and you are back to normal. As you are exhaling, you begin to feel as if you have slowly been eating a pack of mints without considering whether or not you had enough. 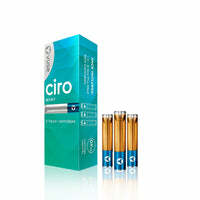 There is also a little tobacco taste at the end that does not upset anyone that VUSE Ciro managed to sneak in. This experience was a different one, but one that will be embedded in your mind. Do not hesitate to take another pull because we understand that your time in the Arctic was like no other. Forget about budgeting your pulls and just enjoy yourself with this flavor that is competing with menthol to see which one is more satisfying and refreshing. In every package there are three cartridges available for you to try, so you will have a great time getting through all those. The VUSE Ciro Vape Pen also helps add to the fun, by offering the cartridge the right amount of vapor to give you an incredible adventure. Aside from this flavor being outstanding, there are several other ones that will also leave their mark. Give mint some time to spice up your life and leave you wowed with the amount of power and taste that it is packed with.